Emvelo products have shown to reduce the occurrence of harmful pathogens. 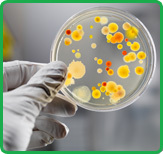 Laboratory tests have been conducted originally at the Agricultural Research Centre (ARC) on Onderstepoort, near Pretoria, South Africa have shown that by using Emvelo it can help suppress the growth of pathogenic bacteria E.coli, Colstridium botulinum and Salmonella sp. The results from these tests demonstrated that all species were repressed after 2 days. Due to the contamination procedures for Salmonella and Campylobacter a high amount was found on day 0. For both pathogens a reduction was shown of a log 6. Under laboratory conditions the effectiveness of the product was demonstrated. Using Emvelo products can assist in suppressing the growth by 'competitive exclusion' of disease and infection.